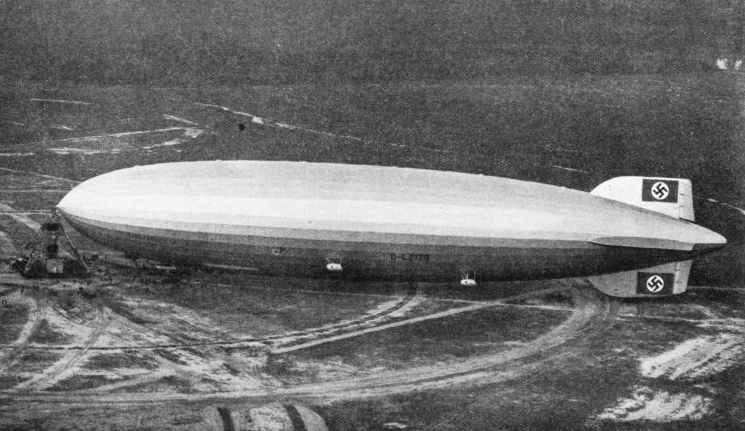 MOORED TO HER MAST at Lakehurst, near New York, the airship Hindenburg dominates the scene with her enormous hull. Regular services are operated between Frankfurt-on-Main, Germany, and Lakehurst, and the usual time for the journey is about two and a half days. 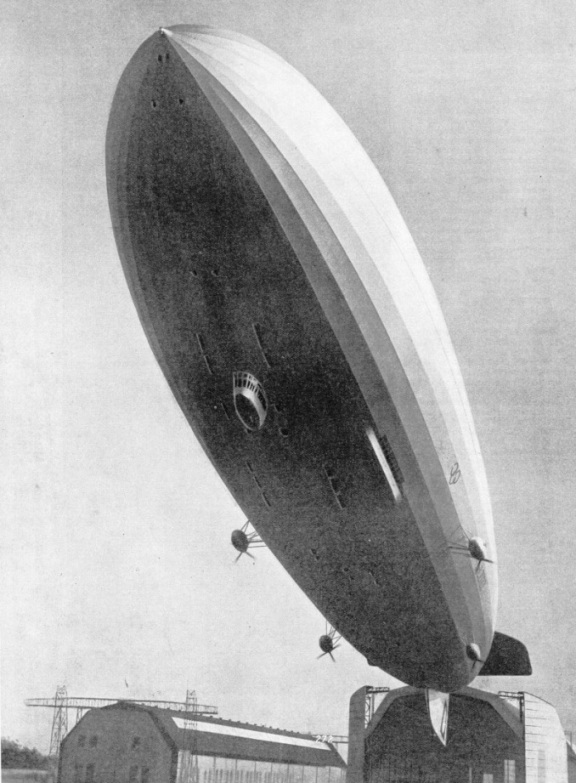 The Hindenburg (LZ 129) has a maximum height of 147 feet on landing wheels. FOR centuries it was the dream of man to ride through space on “mechanical birds” or, alternatively, in “chariots of the air”, and even now there is sharp dispute between the two schools of thought, one favouring the heavier-than-air or aeroplane method and the other the lighter-than-air or airship method. We are not here concerned with the niceties of this never-ending dispute, since the airship is not only an established means of long-distance transport, but is also an example of successful modern engineering practice. It is not so very long ago that imaginative men of pre-engineering days were drawing on paper their conception of what an airship should be. It was to be a long boat suspended beneath a cigar-shaped balloon, the method of propulsion to be man-operated feathered oars. We were to row ourselves round the world in this strange two-faced craft, combining balloon and boat. This conception was the foundation of the modern airship service which runs between Frankfurt-on-Main, in Germany, and Lakehurst, near New York, a journey performed regularly and with comparative ease by the Hindenburg, or LZ 129, in roughly two and a half days. The Hindenburg, which was built after the Graf Zeppelin, is the largest airship yet built by the Luftschiffbau Zeppelin Company. She has a maximum gas capacity of over 7,000,000 cubic feet, practically twice that of the Graf Zeppelin. The overall length of the Hindenburg is 803 feet. She has a maximum diameter of 135 feet, a maximum height on landing wheels of 147 feet and a maximum width of 153 feet. Former Zeppelin types were less compact in design than the Hindenburg, and there is another marked difference in the newer type - the pilot’s cabin is now separated from the passenger cabins. The latter are now entirely inside the ship on two decks, one above the other, and the pilot’s cabin projects from the base of the ship, thus leaving more floor space for the passengers and also affording the pilot a better view over the stern. Lightweight linen and cotton are used for the envelope fabric, and this is treated with several coatings of cellon or “dope” which renders it smooth, thus reducing friction while the craft is passing through the air and making the covering as weatherproof as possible. Aluminium powder is used in the cellon varnish to make the surface glossy. This is done to reflect the sun’s rays as a protection to the airship against excessive heat. The top inside the envelope is painted red to protect the craft against ultraviolet radiation, and where the envelope adjoins the propellers it is specially reinforced to prevent hard objects, such as ice, from penetrating the gas-bags within. These gas-bags are made of special film fabric. Between two layers of fabric is an almost gas-tight film, and between every two gas-bags there is a shaft to allow for the escape of gas from the valves. The shafts lead into the open air and also run down to the keel to allow of adequate ventilation. Hydrogen is the gas used for lifting. THE FOUR ENGINE CARS of the Hindenburg are suspended from the central section of her hull, as seen in this photograph of the airship leaving her hangar. Each car contains a Daimler-Benz diesel engine of about 900 horse-power. The four-bladed propellers have a diameter of 19 feet and are sheathed with brass on the front edges as a protection against the impact of rain. The design and construction of the frame are based on traditional methods which the Zeppelin Company has found so successful. The braced frame is of light metal members with the interior of the hull divided into sixteen compartments to hold the gas-bags. 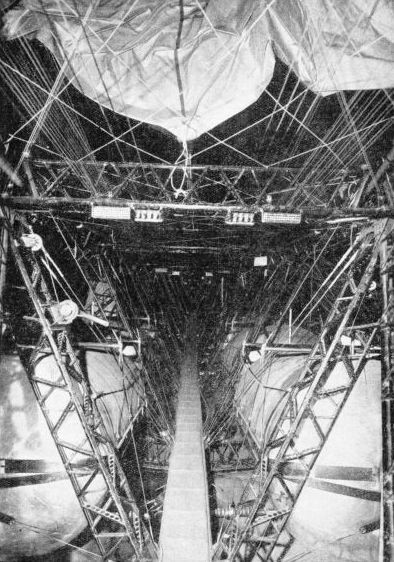 At the base of the frame is a floor for the loading of cargo and for providing communication between the various parts of the airship. The engine cabins are suspended outside the frame and envelope of this great airship. Reference to the illustrations accompanying this chapter will give a detailed idea of the method of rigging. It will be seen that the triangular type of member has been used in this ship as in a number of her predecessors, but the members are of greater height and thickness to withstand the greater stresses which so large an aircraft is called upon to meet. The fifteen main rings of the hull are arranged one behind the other at intervals of 49 feet, thus dividing the hull into sixteen sections, each of which contains a gas-bag. Between every two main rings are two auxiliary rings, all rings being in the form of a polygon of thirty-six sides. The longitudinal members are attached to the corners of the rings, the main rings having truss frame members on the circumference, braced centrally by wires, the intermediate rings having plain triangular members but with no bracing. The keel longitudinals run for almost the entire length of the ship from the nose to where the stabilizers are fixed. Four engine cars, in pairs and braced, are suspended from the central section of the hull. There are two each to port and starboard, and each one holds a Daimler-Benz diesel motor of approximately 900 horse-power, with 1,200 horse-power maximum capacity. Each of these engines drives a propeller (19 feet in diameter) by direct shaft and through an intermediate shaft with geared coupling. The propellers are four-bladed and are sheathed with brass on the front edges as a protection against the impact of rain. Water and air coolers are fitted in the forward openings of the engine-rooms; the coolers are fitted with regulating valves to control the amount of air passing through them. Each engine car holds an electrically heated oil tank. To facilitate engine starting in cold weather the cooling water is preheated by a special heating circuit. Fuel is stored in the keel frame in cylindrical drums or tanks of light metal. The tanks are installed on either side of the engine-room gangways. BRACED AND SUSPENDED from the lower part of the Hindenburg’s hull, each engine car contains an electrically-heated oil tank. Fuel is stored in the keel frame. 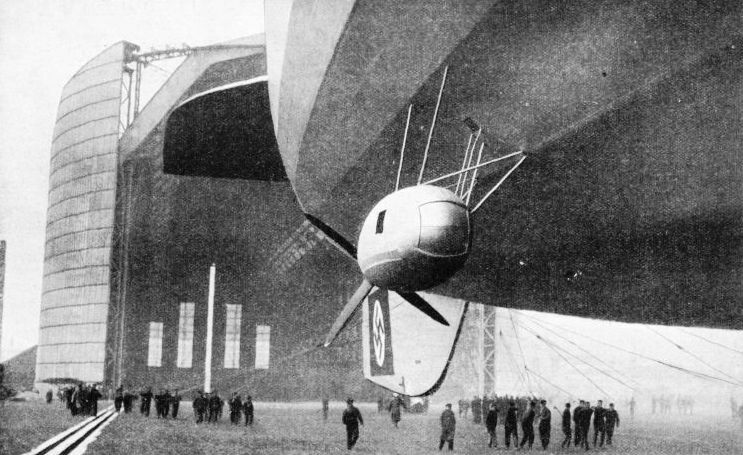 This photograph shows also the airship leaving her enormous hangar. The controls of the Hindenburg are particularly interesting by reason of the bulk that they themselves must stabilize. The rudders and the ailerons, for lateral and longitudinal control respectively are partly balanced, and the lower vertical fixed stabilizing fin has a landing wheel attached to its forepart. There is another wheel beneath the forepart of the pilot’s cabin. This cabin is 30 feet long, with a maximum width in the centre of 8 feet. It contains the wheelhouse, the map and navigation room and the direction-finder room. The controls at the stern can be worked by handwheels and cables from the wheel house, and one man can work the rudders and the ailerons, although there is electric rudder control in addition. Steering can also be effected automatically by the gyro-compass. Ballast used is mainly water and there is a switch to control both instantaneous ballast, which can be discharged at once, and ordinary ballast, which takes longer to discharge. There are four bags of instantaneous ballast fore and aft, each holding half a ton of water. In the gangways to port and to starboard are thirteen barrels of ballast holding 550 gallons each and two holding 440 gallons each. There is an electric power plant amidships and independent of the forward drive plant, one unit generating the current required and another serving for “boosting” or for emergencies. Each unit consists of a 40-50 horsepower diesel engine, with generator of 30 kilowatts, and there are a transformer, an accumulator and a connexion for the hangar mains. The passenger quarters of the LZ 129 have been designed for spaciousness and comfort. They are, indeed, remarkable, and even though they cannot be compared with those of a seagoing liner they are incomparable with anything at present flying through the air. The windows are arranged at an angle of forty-five degrees, with the apex of the angle pointing outwards so that passengers may view the ground and horizon easily. It was in this airship that smoking was first allowed, an isolated smoking room having been provided and protected from the danger of fire. This smoking room is equipped with its own system of ventilation. CYLINDRICAL DRUMS or tanks in the keel of the airship store the fuel for the four diesel engines which propel the Hindenburg. The tanks are situated on either side of the gangways which run down the length of the lower part of the ship. Any one entering or leaving the smoking room must pass through a “lock”, one of whose doors must be closed before the other can be opened. The lock is ingeniously arranged as a bar, and one of the duties of the bartender is to prevent absent-minded smokers from attempting to return to any other part of the ship before they have removed their cigars, cigarettes or pipes. The upper deck, or A Deck, holds the main passenger rooms, which are reached by a double stairway, and is so broad that a passenger might momentarily believe himself to be in an ocean liner. The total floor space of the main rooms is 5,380 square feet. In the centre of this deck are the staterooms, which are arranged in four rows and divided by two passage ways. There are no windows to these rooms as they are “inside” rooms; but air conditioning provides appropriate temperatures and fresh air. There are altogether thirty-five two-berths cabins, each equipped with running hot and cold water, a small dressing table, a wardrobe and luggage storage space. Twenty-five of these cabins are situated on A Deck and ten have been recently installed on B Deck. Thus seventy passengers can be accommodated. In each cabin the upper berth can be made to disappear for single occupancy or for extra roominess during the day. Beyond the contours of the ship and on either side of the cabin accommodation are wide spaces enclosed by windowed walls of a special transparent material, and outside it runs a miniature promenade deck 45 feet long. 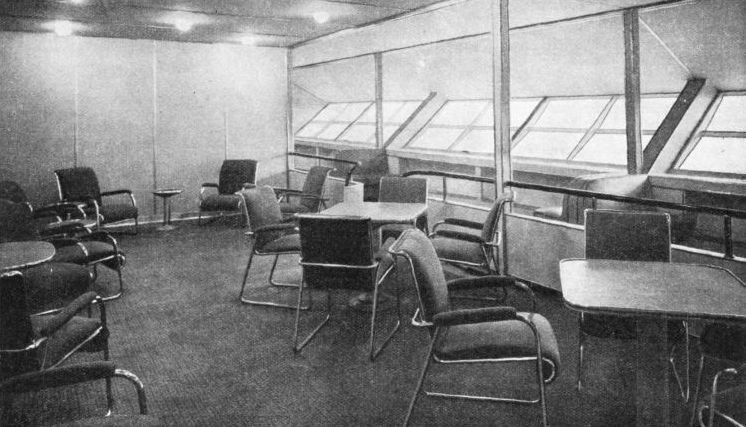 PASSENGER ACCOMMODATION for seventy people is provided in the Hindenburg in thirty-five cabins situated on two decks. This diagram shows some of the cabins which are in the central part of the ship and are air-conditioned. On either side of the cabins are the halls and promenade decks as illustrated below. The lounge, reading and writing room and library are on the starboard side, and the dining room is on the port side. The usual ships’ offices are carried also. The speed and performance of the airship Hindenburg are a tribute to the engineers who built her. She has a cruising speed of seventy-eight miles an hour and a maximum speed of eighty-five miles an hour. The fare for the single voyage from Frankfurt-on-Main to Lakehurst is £49 3s. 6d. The return fare, £115 3s. 9d., is more than twice the single fare, because it has to be paid on a sterling basis. These fares are surprisingly moderate. It is a common saying that speed has to be paid for; yet a passenger can travel in the Hindenburg between Germany and the United States in little over half the time required by the fastest passenger ship afloat, and at a cost not unduly exceeding that of first-class accommodation in a transatlantic liner. One of the many problems associated with all air travel is the question of the economy of weight and space. It was the late Count Zeppelin’s belief that this problem would be solved more satisfactorily in the lighter-than-air type of craft than in the heavier-than-air type. He felt that for the long transcontinental air journeys of the future the airship would have a distinct advantage, and it must be admitted that Zeppelin commercial experience has been extraordinarily successful from the early days of airships. 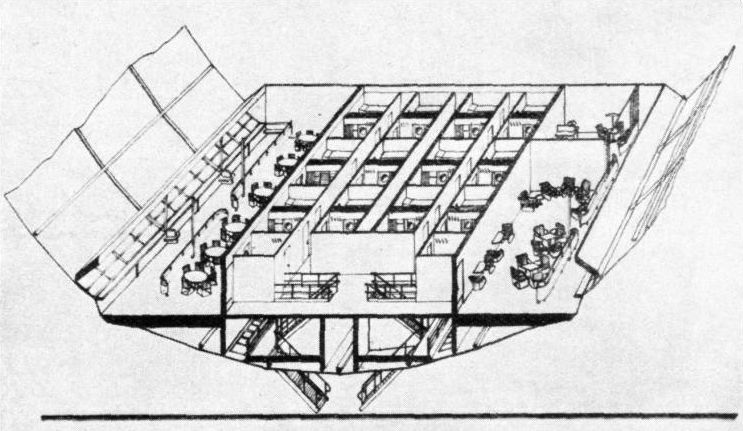 In the building of the Hindenburg every superfluous ounce was regarded as deadweight and every unnecessary square inch as a serious wastage of space. Yet maximum comfort and space had to be provided for the seventy passengers; and it was done, for the passenger space is far from being ungenerous. There is a solidity about this airship which is astonishing, and is a tribute to the engineering skill of German airship builders. THE STARBOARD HALL of the Hindenburg, built outside the cabin accommodation, has windowed walls of a special transparent material. A miniature promenade deck runs outside it for a length of 45 feet. The windows slope outwards at an angle of forty-five degrees to give a clear view of the ground below as far as the horizon. You can see the photogravure supplement to this article by following this link. You can read more on “Airships” and “Types of Airship” in Wonders of World Aviation. 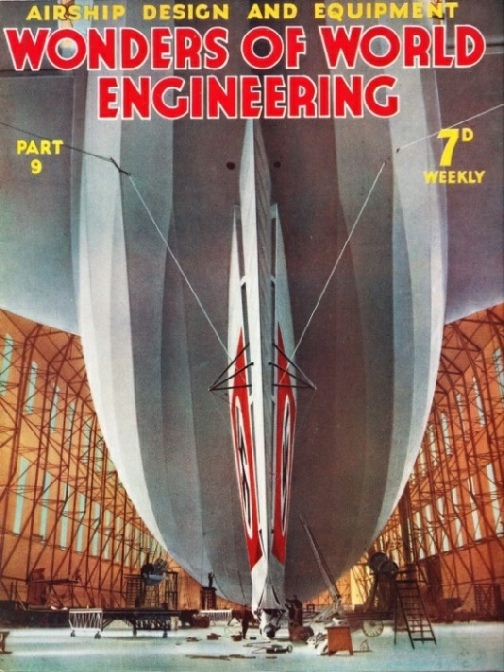 The cover of Part 9 shows the giant airship Hindenburg (LZ 129) leaving her enormous hangar at the beginning of one of her voyages to America.